There once was a pebble on a rocky shore. It was small and round and nearly smooth. 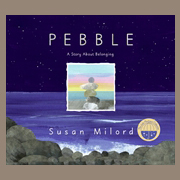 Amid a seascape dotted with endless rocks, one pebble yearns to be special. Can you find the pebble? Susan Milord’s clear prose and exquisite collages offer a timeless message about finding one’s place in the world.